Finding interesting and new ways to paint is always a fun way to craft at home. With some glue, salt, and food colouring you can make some very unique, very entertaining pieces of art. Just collect the few supplies and get ready to have some fun. Step 1. First thing to do is to prepare your food colouring so you are ready to paint. The best way to do this is to use an ice cube tray and put one colour per slot. Just use a few drops of food colouring, 5 or 6, and then fill them with water. You will also want to keep just a glass of clear water handy to rinse out your brush. Step 2. Now you are ready to begin with the craft. 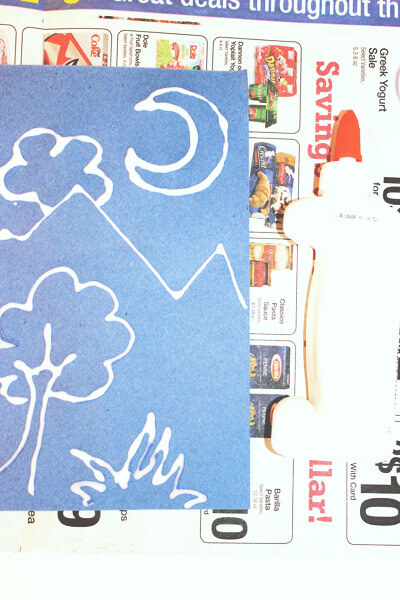 Using the Elmer’s glue you draw your picture. You can choose a pretty landscape, a train, or a butterfly. If you can draw it with a pencil then you should be able to draw it with the glue as well. Step 3. Next spread salt all over the picture so it sticks to the glue. You do not have to use a lot of salt. 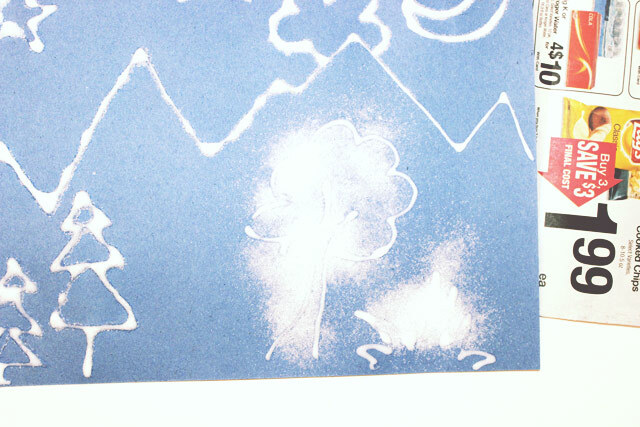 In fact, just sprinkle a few spoonfuls on one part of your glue drawing. Then lift up the construction paper and dump the unstuck salt back into a separate bowl. Then sprinkle that salt from the bowl on another part of your drawing. Do this until all the glue is covered. 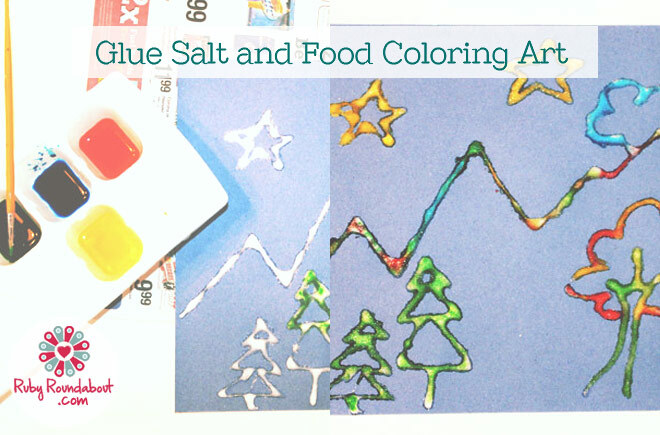 Shake off the excess salt and get ready to paint with your food colouring. Step 4. 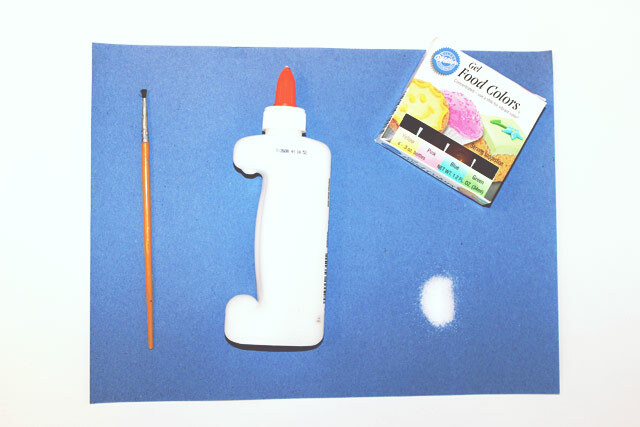 Dip the brush in one of the colours and very gently dab it onto the salt and glue of your picture. Watch as the salt absorbs the food colouring. Repeat this step until you have coloured your whole picture. Remember you just need a little dab of the food colouring to change the salt colours. Also, if you want your colours to stay bright, then be sure and rinse out your brush so you don’t accidentally mix any colours. When finished you can enjoy your unique piece of art. Step 5. When you are finished you can try to let your picture dry. Just as a note however, because of the salt and the water the Elmer’s glue will not stiffen as usual. Drying takes a very long time and even then the finished product will be very crumbly, so be careful not to touch or move your picture too often. 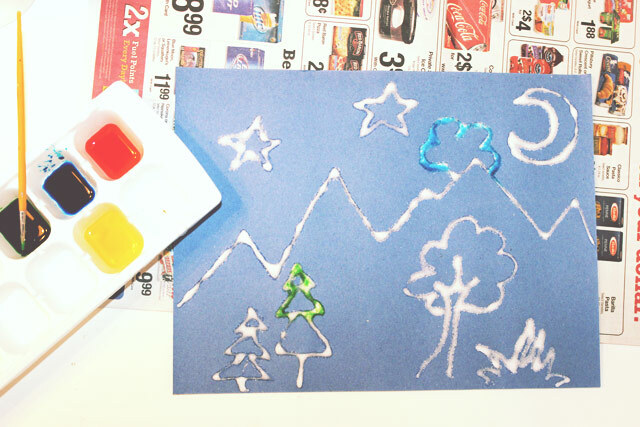 The glue salt and food colouring art is so easy and can quickly be done with items already around the house. With coloured construction paper and a good imagination, really the possibilities are endless. 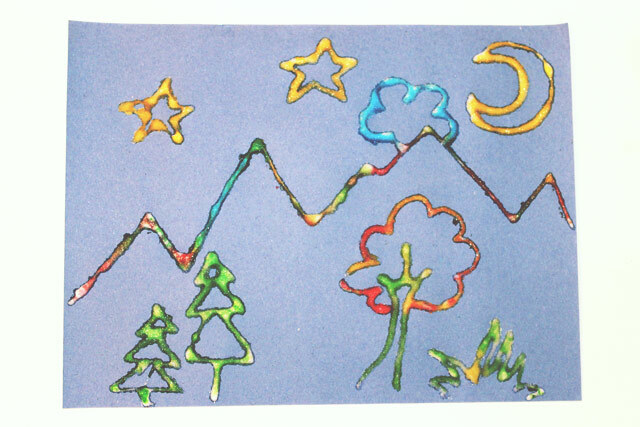 You can write messages with your glue or draw any number of pictures. Be creative and just have fun with this super easy project.